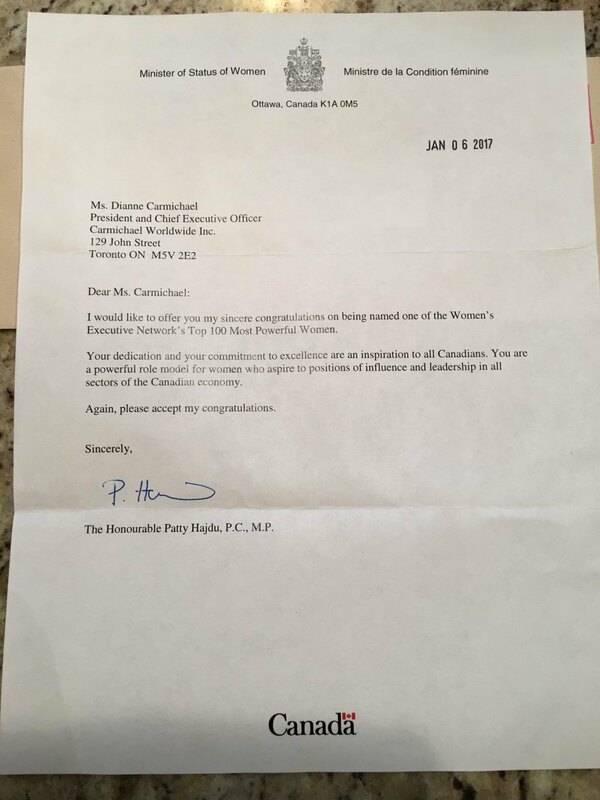 Toronto, ON (November 23, 2016) – Dianne Carmichael has been named a Women’s Executive Network (WXN) 2016 Canada’s Most Powerful Women: Top 100 Award Winner. Launched in 2003, the Top 100 Awards celebrate the incredible accomplishments of Canada’s top female executive talent as well as their organizations and networks. Dianne will receive the Sun Life Financial Trailblazers and Trendsetters Award: Recognizing Women who are first in their field and have made a great contribution to Canadian society. Dianne will be honoured during a gala celebration at the Metro Toronto Convention Centre on November 24. Dianne has an exceptional track record of success in the health care and business worlds. Under her leadership, Best Doctors Canada became one of the most sought after employee benefits programs coving over 6 million Canadians, changing diagnosis 22% of the time and modifying treatment 61% As chairman and CEO of Worldsource Wealth Management she grew the company to more than $8 billion in assets. She was the Founder & President of UHN Solutions where she developed a public/private funding model that advanced patient care. As Managing Director for MaRS Health, she pushed for healthcare transformation, working to scale the most disruptive health technology ventures with the potential for global impact on patient care. Dianne sits on a number of boards including Holland Bloorview Kids Rehab Hospital, Patients Canada, Canadian Association for People-Centred Health and the advisory board to the Dean of the Faculty of Health at York University, Closing The Gap and the Risk Capital Committee of TOHealth! She sat on the Steering Committee for the MoHLTC Consumer e-health Strategy. She leads the health tech sector for Chair Jim Balsillie’s Council of Canadian Innovators whose mission is to shape public policy to help companies scale globally. Recognized as one of the Top 20 Business Women in Canada, profiled as one of the Top Women to Watch, and awarded Canadian Women Transforming Healthcare, Dianne has held numerous business leadership roles where she dramatically grew operations, staff and consumers with a mission to improve the lives of Canadians. Dianne Carmichael joins a prestigious community of past Award Winners, including Canada’s most iconic women trailblazers: Margaret Atwood, best-selling author; Dr. Roberta Bondar, astronaut; Arlene Dickinson, chief executive officer, Venture Communications; Christine Magee, president, Sleep Country Canada; Michaëlle Jean, former Governor General of Canada; Heather Reisman, founder and chief executive officer, Indigo Books & Music; and, Kathleen Taylor, chair of the board, Royal Bank of Canada. The full list of WXN’s 2016 Canada’s Most Powerful Women: Top 100 Award Winners can be found at https://www.wxnetwork.com/top-100/top-100-winners/.